Palm’s update to its well-received and long running Treo 650 smartphone goes on sale in the UK. The new Treo phone sees Palm targeting the consumer market, with the 680 coming in a range of attractive colours (US store only) and a lower price. The distinctive chunky aerial has gone (us Europeans apparently aren’t down with that antennae thang), and the new Palm is lighter and slightly smaller than the 650, measuring 0.1 inches slimmer at 4.4 x 2.3 x 0.8 inches (113mm W x 59mm H x 21mm) and weighing 0.8 ounces less at 5.5 ounces (157 grams). As with the 650, the new Treo offers the same fantastic one-handed usability and ergonomics, with an improved backlit QWERTY keyboard and the same bright 320 x 320 pixel touchscreen display. The Treo 680 also comes with beefed up Radio Frequency (RF) sensitivity for improved phone performance, a SD/MMC/SDIO-compatible expansion card interface and upgraded Bluetooth 1.2 connectivity. Sadly, there’s still no Wi-Fi onboard (although new unlimited data deals like T-Mobile’s Web’n’Walk can now provide alternative, albeit slower, means to keep connected on the move) and the onboard camera can also only muster up a rather disappointing 640 x 480 pixels resolution. We have to say that this still outperforms some megapixel cameras we’ve seen on other phones. Despite its age, we still view the Palm OS as the best choice for smartphones, with the platform offering an immense range of third-party programs and some lovely user-friendly touches (the threaded SMS interface is still a treat to use). 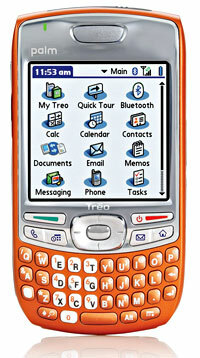 As with the Treo 650, the new phone offers the usual cornucopia of functionality and features including email, web browsing (via Blazer 4.5), the excellent Pocket Tunes music player, calendar, video, photo album and Documents To Go letting users view, edit and share Word and Excel documents on the move. The interface on the 680 has also seen a few usability-boosting tweaks, with faster navigation and an ability to fire off a discreet “can’t talk now” text message when you’re too busy to answer a call. Inside, the phone’s internal memory has been beefed up to 64MB, while the battery life has been slimmed down from the 650, with the smaller 1200mAh rechargeable Lithium Ion cell rated for four hours of talk time and 300 hours of standby time. The product is available from today at the Palm e-store (US only) in red, orange, white and silver for £299 (contract free), although we’ve already seen discounted prices popping up elsewhere.